OK, I know this is supposed to be wordless, but you may not get my title unless you have seen the movie "Sixth Sense" (if you haven't then you are missing out). There is one scene where a ghost in the house keeps going in the kitchen and opening all the drawers and cupboards. For some reason Zoe finds this intriguing herself and whenever she does it, I always think about that scene. Sorry for the words!!! interesting photo !How cute is she. My little boys have to close every door and drawer -even on top of me or my fingers. LOL--someone has been busy!! Great shot. LOL. 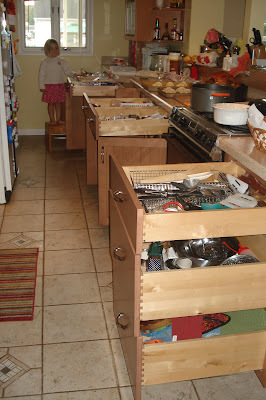 If it weren't for our drawer locks, my kitchen would look a lot like this. I think she is SO cute! I think that would spook me out a little, too! Thank goodness for safety locks!! LOL my sons are always pulling stuff out of all the drawers (yes they have figure out how to open them).